13 x 19" 17 x 22" 8.5 x 11"
For fine art photographers looking for a matte medium that can deliver a wide color gamut and high brightness, Epson has developed Cold Press Bright Paper. Made from 100% cotton rag and using a cold press production technique, this paper features a textured matte finish. The heavy weight of 340 gsm, thickness of 21 mil, and opacity of 98% further give this paper the look and feel of a true fine art paper. Also, through the use of optical brightening agents, this media will help deliver bright whites, deep blacks, and a wide color gamut. Designed for longevity, Cold Press Bright is free of acid, lignin, and chlorine and is pH buffered. 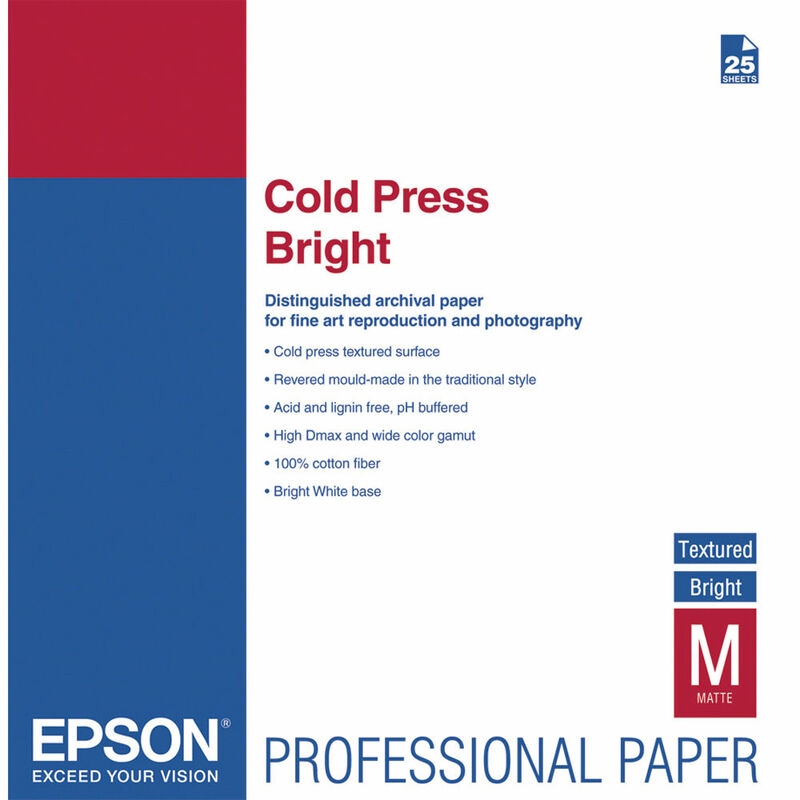 Box Dimensions (LxWxH) 25.1 x 20.0 x 1.5"
Cold Press Bright Paper (17 x 22", 25 Sheets) is rated 4.8 out of 5 by 12. Rated 5 out of 5 by JonD from Epson's BEST Ever! For fine art printing, including photographs and art derived from photos, Cold Press Bright is, in a word, AWESOME. Heavyweight, instant drying, aboslute pure colors from my Epson 7900 printer make this my new favorite paper. Since my first box, I've bought five others and am about ready to reorder.This paper is not smooth--it has a slight texture which gives prints a dimensionality that is not present in other smooth papers.Blacks are BLACK, and colors are from subtle to VIVID--tonal transitions are smooth and perfect.This paper is utterly terrific. Not cheap but when you're printing in 16 x 20 or so, at about $ a sheet, it is cheap at twice the price.My portfolio is now about 30 pounds heavier as I have been motivated to reprint all kinds of things on this paper.Try it, you'll be happy. Rated 4 out of 5 by anselm6 from at last the right paper i am an advanced amateur. a few years with the canon 5D mkII and the top canon glass. i knew i would want a matte finish for B and W prints but have yet to find one that suited. i have it now with this cold press bright textured matte paper. the structural detail in these prints is outstanding. accuracy of tones across the entire range is excellent. when i put a border around the image the texturing of the paper created an illusion of 3D depth as though the print was under glass in a surrounding mat. this will be my choice in the future. more comments when i have experience using it for color prints. Rated 5 out of 5 by Bob F. from beautiful paper I prefer the bright version over the natural in both Cold and Hot Press simply because of the snap it gives my images. That is very subjective, I admit, but nevertheless does not belie the stunningly rich nature of these papers. Epson packaging is the standard others should strive to. Do not use UV protected glazing with these bright papers. It defeats the purpose of the optical brighteners. Rated 5 out of 5 by John L. from Fast Service Cold Press Bright White Main use for this paper is making giclees of watercolor paintings. I print from Photoshop and find very close matches among originals, soft proofs, and final prints on CPBW, using only Epson profiles. Look and feel are similar to original paintings, please my client quite well. Original watercolors are less than 17x22, so it's convenient to use all Epson products in the process of producing reproduction prints. Neither expensive or inexpensive, Epson Signature paper fills my needs quite well. Rated 5 out of 5 by Anonymous from Cold Press Bright Epson paper This paper completely blew me away! For a Matt based medium it's color realism is remarkable! The texture adds a class of quality that other papers just seem to have. Epson seemed to get all the variables just right. Rated 5 out of 5 by sportndogartalan. from Great paper The oversize images )compared to 13x19in. paper are super impressive and sell very easily. he textue of the cold press bright is just like the watercolor paper I pain on, and looks try autistic, and handcrafted . Rated 5 out of 5 by Keith from Wonderful Paper! This is a great paper. Wonderful texture, rich colors, great gamut. I've used this paper for a number of years and it continues to support all of my large printing needs.